Our first “detour stop” was Soledad Canyon RV Resort near Acton, California. We arrived without drama and found a nice place on a ridge looking out at the San Gabriel Mountains. 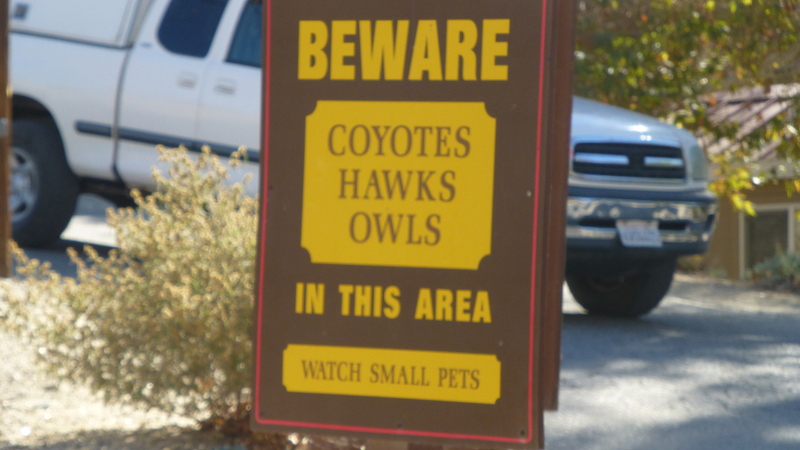 We did see this sign as we entered our camping loop warning people to watch their small pets. We were glad Elko is big. That evening we took a walk through a huge campground that had been allowed to deteriorate in a sad way. Large sections were unusable. We could hear the pack of coyotes howling from across the narrow canyon. We could also hear many dogs barking from a local rescue facility. 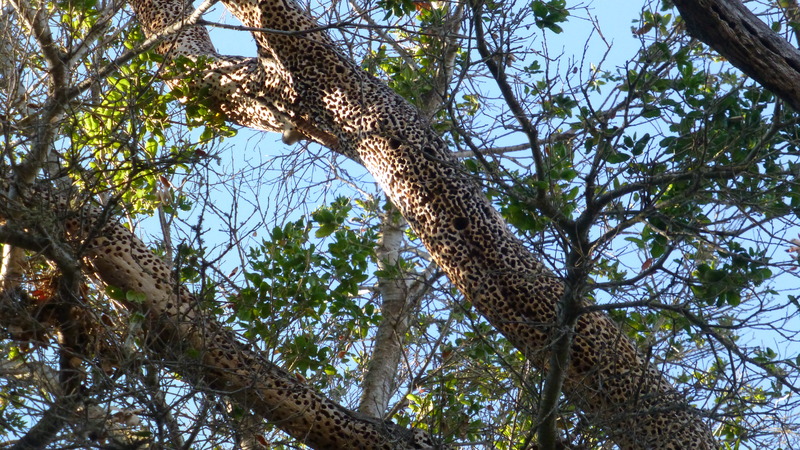 (You could hear one or both groups pretty much throughout our stay.) “This place is creepy” became a common refrain. During the walk we also became aware that Elko had eaten something he found along the way. The fact that Elko had eaten something rotten became very apparent the next day. No details are necessary, but he was running out the door to let loose every hour or so. Since I am the one that can wake up in a moment, I was the one who would follow him out many times a night, hear the dogs and the coyotes, and pray the coyotes and/or a mountain lion weren’t in the vicinity. The place was creepy! After two long days and nights we went to a local vet who said that labs eating things they shouldn’t keep him in business. He tested for parasites and giardia (both negative), and gave Elko an antibiotic and special food. Fortunately, he bounced back in time for us to move on – we’d of had to stay longer in the creepy place if he couldn’t travel. We had another unfortunate travel day! We have two GPS devices, one designed for RVs which knows our height and length and is suppose to keep us out of trouble with tight turns and low tunnels/overpasses. The other is for regular vehicles that we have used mostly successfully for years. Since we have had trouble with both devices on this adventure we decided to use them simultaneously -and I had an old fashioned map in my lap. Each GPS was suggesting a different route, both of which turned out to be bad, the RV one suggested a route we were too long for and the other was trying to send us down a road that wasn’t even big enough to be on the map. I eventually resorted to calling the resort and taking their recommendation to come in from the north (even though we were coming from the south). We aren’t sure how we are going to solve our GPS problem – even Google Maps on our phones aren’t always dependable. During our circuitous route we saw lots of California agriculture, the largest feed lot ever, oil wells and some kind of light collection euipment that we didn’t understand. 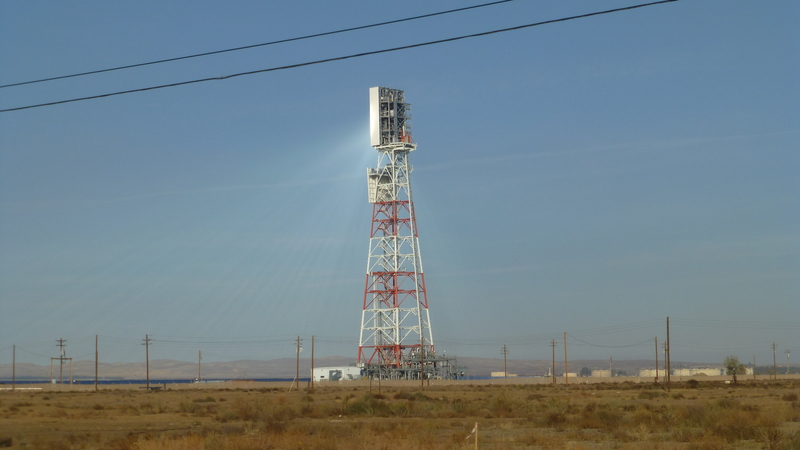 It appeared that there was a large array of mirrors projecting the sun’s rays onto a panel high atop this tower. It seemed like something out of a science fiction movie. If you know what it was, let us know. After our travel adventures, we arrived at our second “detour stop” after dark, (very dark). Then it is time to pick a spot! We got up close and personal with an overhanging tree Randy couldn’t see in the dark, but fortunately had no permanent damage. 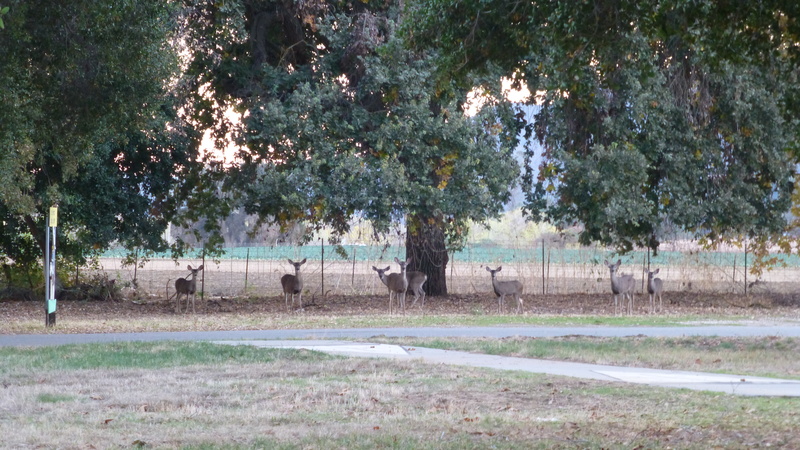 Our current place is the San Benito RV Resort near Hollister, California. This place isn’t creepy – its nice. 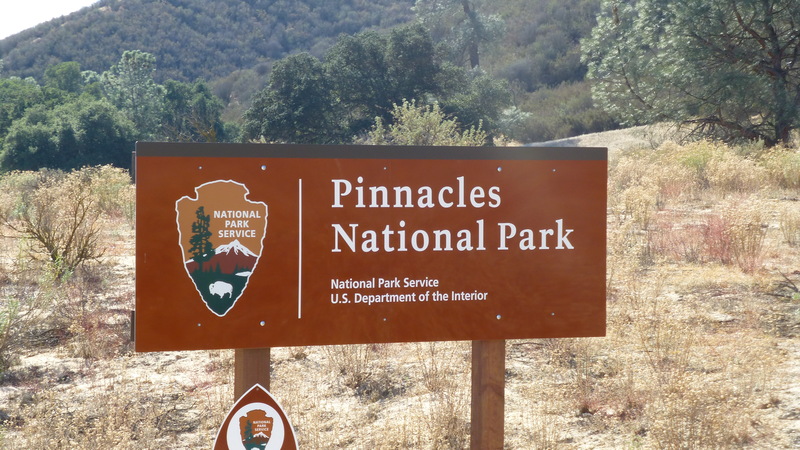 Our other activities have been down the road a few miles at Pinnacles National Park. It is the newest park in the system having just received that designation in 2013. Today we drove to the park and hiked to and explored Bear Gulch Cave. 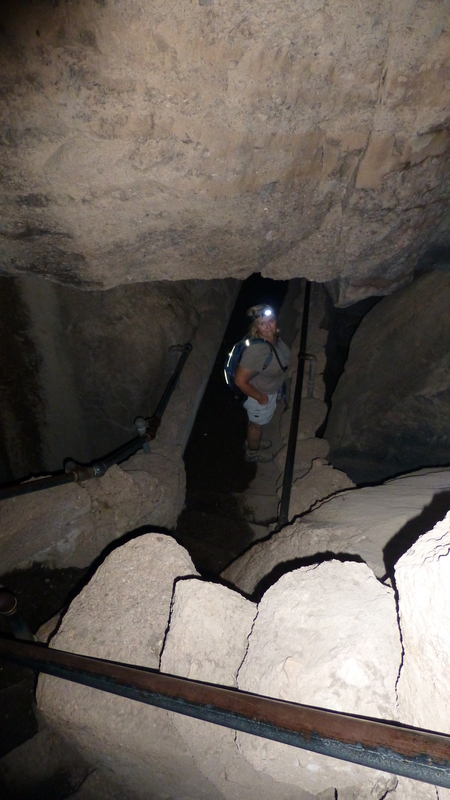 We usually go to caves that have a ranger led tour and electric lights so this one was different. This one was just us and our headlight and flashlight. Of course, it was in the park so there were people around and wasn’t too dangerous. It was interesting and not creepy until I thought of the San Andreas fault. We did have a couple great things happen in the last week (besides surviving the drive, Elko’s illness and the creepy place). We had our first visual computer link with Natasha, Seth and Archer. Archer was far more interested in looking at himself on the computer, than interacting with us, but that will come. And, we got our third, and final, volunteer position for summer 2015. We will be at Chief Plenty Coupes Historic State Park, near Billings, Montana for the month of September. It will host two large (500-700 people) Native American events in September as well as school field trips. I will be working education, and Randy will be doing maintenance. We are very excited about this different type of opportunity. re: Tower and mirrors. It seems very small from your picture, but your description of a tower with sunlight focusing mirrors sounds like a solar power plant. The sunlight is focused on a small area on the tower that boils water, generates steam, drives a turbine, generates electricity. There is an enormous solar power generation facility outside of Las Vegas– acres and acres of mirrors. (Largest in the world, I think). Or your tower facility could be something else. It looked like some kind if solar power generator but different than others we’ve seen. It was about 2 football fields side by side. The picture leaves much to be desired since we didn’t even slow down because we were already so late. Your explanation made good sense – thanks Jim! Jim is correct, Serene. I just can’t figure out why your engineer husband didn’t figure that our. Oh that’s right, he is a software engineer! As Jim mentioned there are several now built and operating. Not sure the verdict is in yet on how they do on long term operation. And they are hard on birds that happen to fly too close to the tower and get fried in the concentrated light. And your September sounds like it will be very interesting! Poor birds! The light seemed very intense – it really glowed!